Tartaric acid is a dihydroxy dicarboxylic acid that occurs naturally in grapes and is also produced synthetically. It is used as an acidulant in wine, food, and beverages; a raw material in the production of emulsifiers; an excipient and buffering agent in pharmaceutical products; and in other applications in gypsum and effervescent antacids. Wine-producing countries such as Italy, Spain, and France supply the majority of the natural tartaric acid, while China is the single largest producer of the synthetic product. The competition between natural and synthetic tartaric acid lies in pricing, and synthetic tartaric acid is a much cheaper option. As a result, there has been a shift toward increased use of synthetic product, which had about a 50% market share in 2016 compared with only 30% in 2006. The wine, food, and beverage sectors are the largest downstream markets (accounting for over 56% in 2016) for tartaric acid. As an acidulant in wine, the level of tartaric acid being added varies among major wine-making countries. This is because of factors such as the acidity level in the grapes, associated with weather conditions; the efficiency of ion exchange practices; and the schooling and education of industry. Among wine producing countries, Australia has the highest level of tartaric acid added to wine while European countries see the lowest. Growing demand for wine continues to drive tartaric acid consumption. As an acidulant and flavor modifier in food and beverages, tartaric acid competes with citric acid although in many applications it is used as a secondary acidulant. Growing consumption of nutritional bars and sports and protein drinks, as well as the introduction of fruit-flavored beverages, supports tartaric acid demand growth. Global consumption in the wine, food, and beverage sectors is forecast to grow at an average annual rate of 3% during 2016–21. Other applications for tartaric acid include use in cement and gypsum (as a set-retardant and antisolidifying agent in the production of plaster and cement, as well as an anticaking agent in gypsum processing), in effervescent antacids, and as a synthetic intermediate for pharmaceuticals. 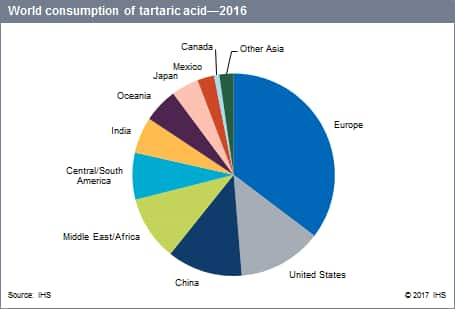 Europe accounted for 35% of the world consumption of tartaric acid in 2016, followed by North America, China, and other Asian countries. Construction is the largest market for tartaric acid in Europe, for cement, plaster, and drywall gypsum board. Wine accounted for most of the consumption in North and South America and Oceania. Pharmaceuticals accounted for most of the consumption of tartaric acid in Asia, largely in China. Growth in demand for wine, food, and beverages is the main factor for increasing consumption of tartaric acid in most regions except Asia; pharmaceuticals, food, and beverages account for most growth in Asia simply because of the minor presence of wine production. Consumption of tartaric acid in food and beverages in developing markets, including Asian countries, is expected to grow along with increasing demand for processed food and ready-to-drink beverages, and improvements in living standards. Significant growth in demand is expected in the Americas, Oceania, and Africa, largely as a result of increased wine production in Australia, New Zealand, South Africa, the United States, Chile, and Argentina.